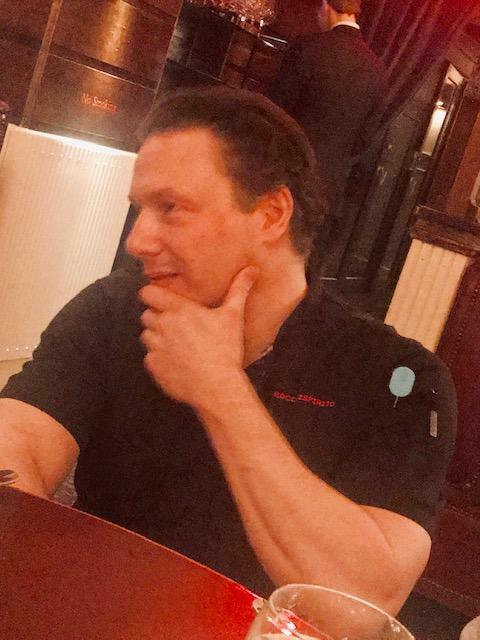 Rocco DiSpirito’s Back: Can Anna Wintour Be Far Behind? 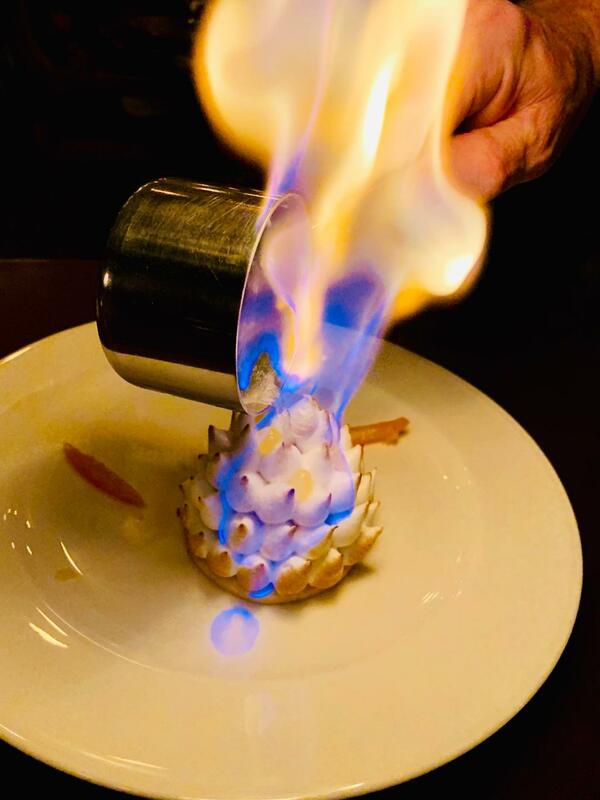 Are you the type that can’t resist baked Alaska? Yes, this is a test. Rocco DiSpirito is back, the email said. To tell the truth, I hadn’t noticed that the one-time celebrity chef was gone. He’s in the kitchen at the Standard Grill, my informant added. I hadn’t thought about the restaurant and beer garden at the foot of André Balazs’ Standard Hotel for a decade. Come early and have a drink at the bar before dinner at Standard Grill. 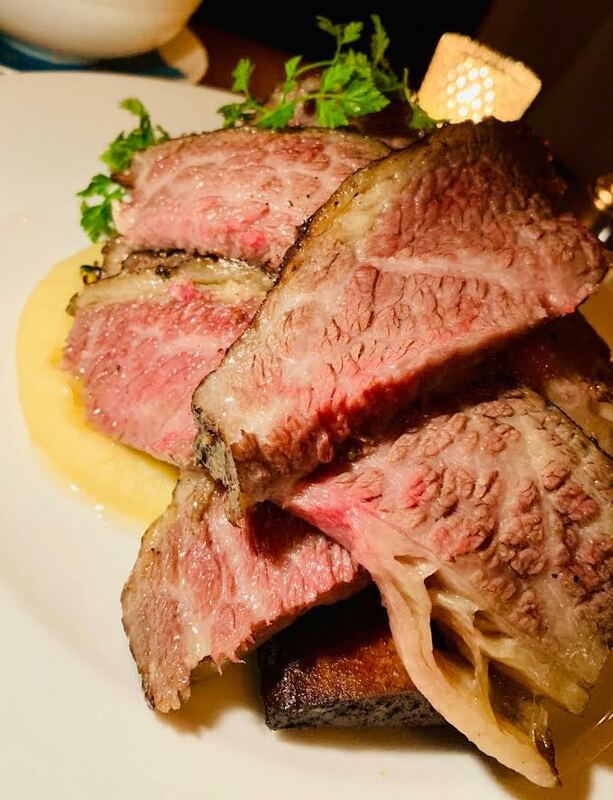 My last dinner at The Standard was a pleasant evening, not an unforgettable affair. As for Rocco, I had tangled memories of the brilliant ingénue at Dava and later at the long gone Union Pacific. Then I recalled Rocco’s on 22nd Street, the setting of the reality television series that ended with the chef being banned from the kitchen and discovering radio as host of Food Talk on WOR in 2004. Later he could be found – not that I cared anymore – hawking Rocco Cookware on QVC, turning out best-selling cookbooks and dancing with the stars. While we weren’t looking, the pretty boy chef became a 52-year-old man. “There he is,” the waiter says, pointing to Rocco in a black shirt and cap at the front corner of the kitchen. 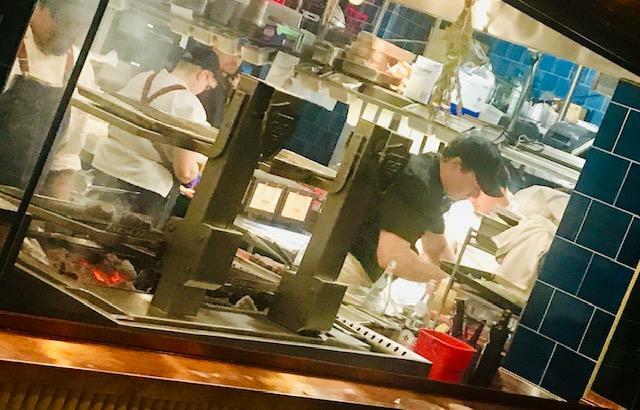 The kitchen darling, now 52 years old, once named “America’s Most Exciting Young Chef” by Gourmet magazine, returns to the range after an absence of 15 years. Not exactly Glenda Jackson playing Lear at 82, but still, compelling for a food writer like me. 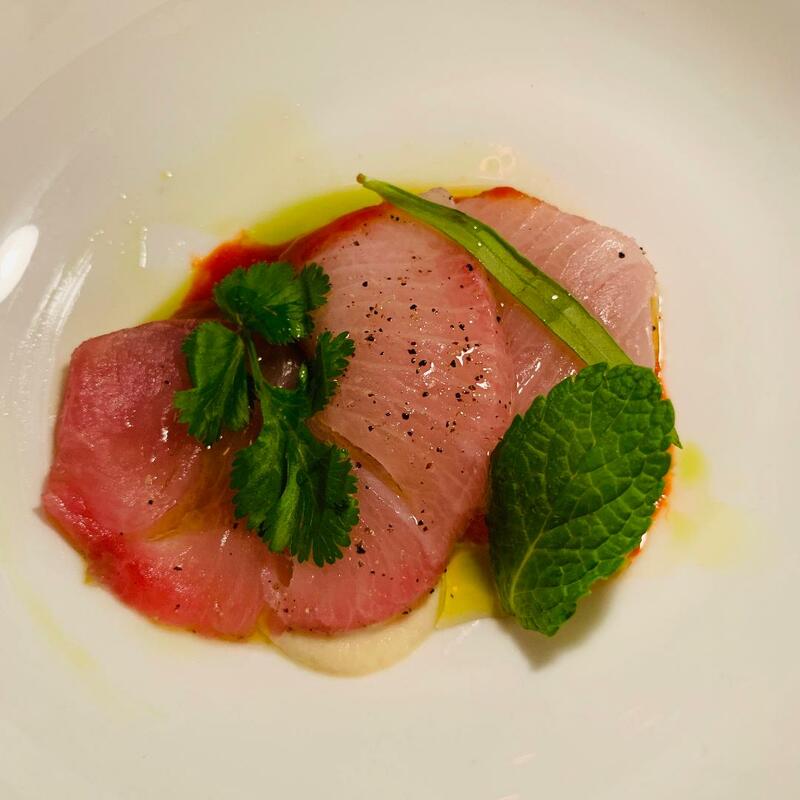 The wild yellow fin tuna dribbled with olive oil is a dramatic gesture. I looked it up in my archives. 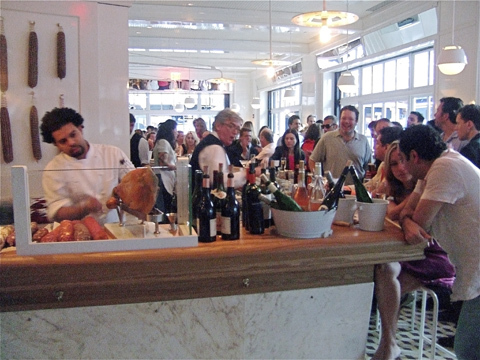 Last time I wrote about the Standard Grill in 2009. “I know I’m in the right place when I see Anna Wintour at the next table,” I wrote then. Not wanting to disappoint my neophilic friends, I decide we will present ourselves to the gods of the reception podium at 8 and hope there’s a table. Well, of course there is -- maybe not the cushy, leather-tufted booth reserved for Anna just across the way, but definitely orchestra seating. 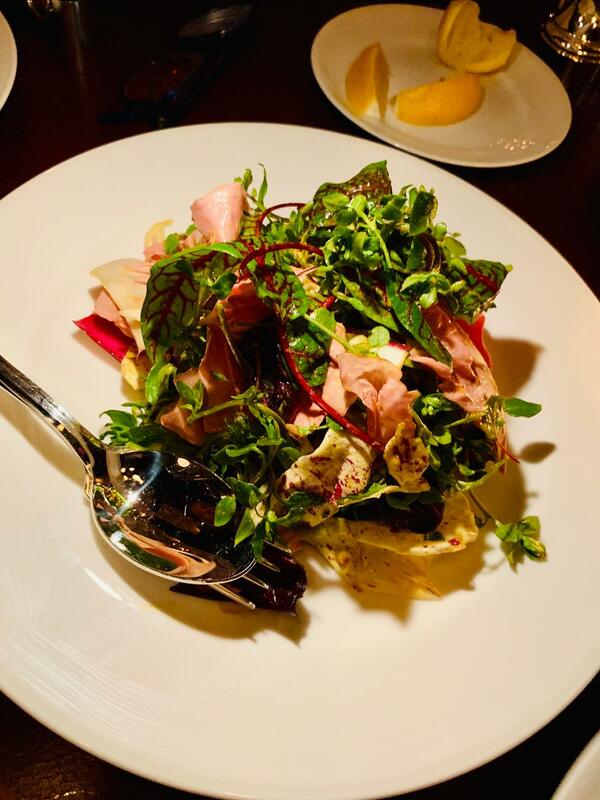 Wild lettuces and Italian chicories are tossed with rice wine vinegar. Teal blue is the theme. For the waiters’ ties and velvet draping windows that used to be bare. Early this March I decide I should see what DiSpirito is up to. There is much to report. You don’t need to be anyone or know anyone to get a Standard Grill table at a reasonable hour. Not yet anyway. I don’t see Anna tonight. 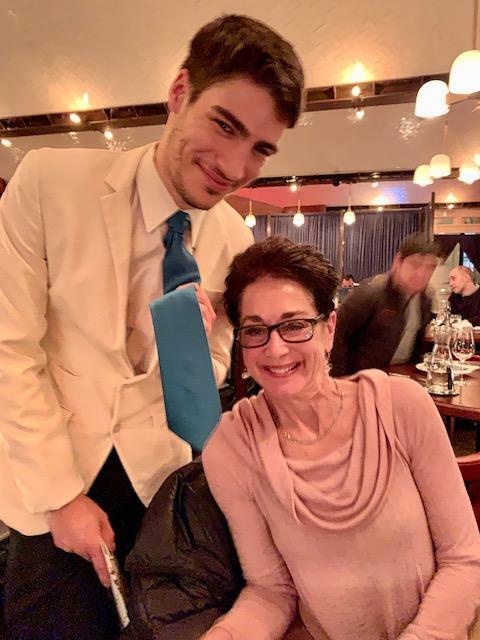 Teal is the color of choice for waiters’ ties, velvet covering the windows, and the menu folded like a love letter at your place in the interior rehab. 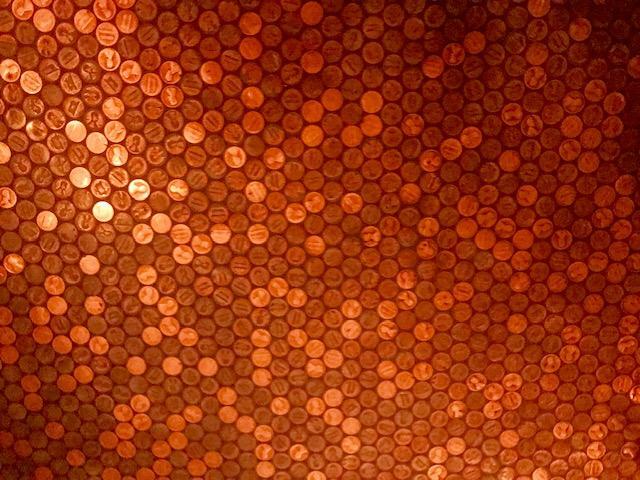 There are supposedly 440,000 pennies in the floor. I worry they might be slippery. Do you recall the coins studding the floor? It’s still got those 440,000 pennies you can trample on. But now leather from the century-old New York company, Demar, covers the table top. Michael Cecchi-Azzolina at the door, recently of Le Coucou, will remember you even if you don’t necessarily remember him. Rocco makes this fabulous “game changing toast” himself from flax seed, oats, chia seeds and almonds. 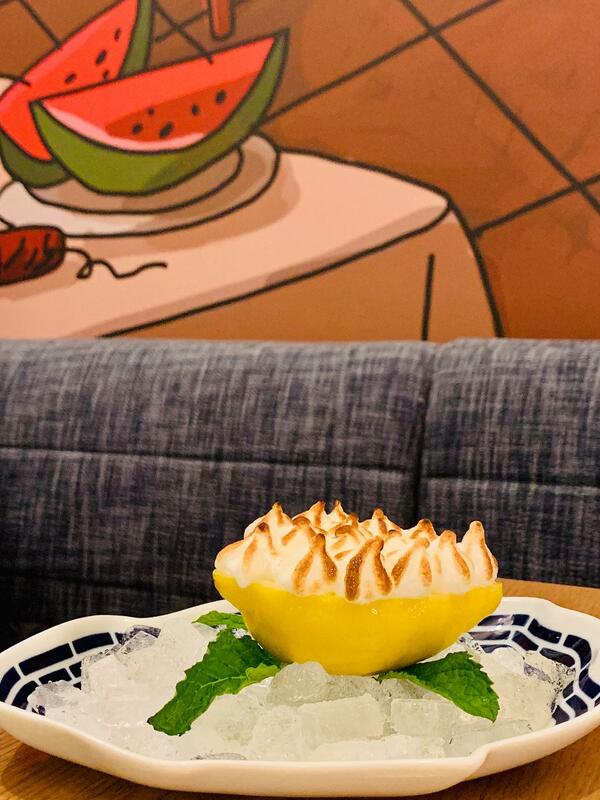 And, I’m aware the chef has been thinking about plant-based recipes and health-focused dishes. Tuna salad on a small square of red pepper amuse is not worthy of the wanderer’s return. 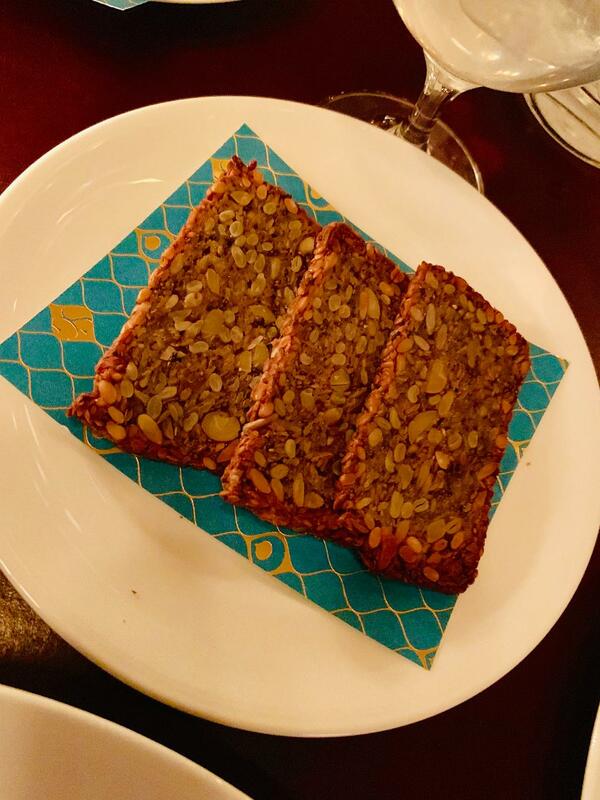 But you’ll forget that nag once the plate of jamon iberico de Bellota arrives to layer on “game-changing toast.” The chef makes it himself: Flax seeds, oats, chia seeds, almonds. It’s fabulous. I wish I’d brought a plastic baggie to take some home. The updating of the chef’s legendary uni with scallops in tomato water and mustard oil is very subtle. The salad is exciting too, wild lettuces and talian chicories tossed with rice wine vinegar and Futsu squash confit. 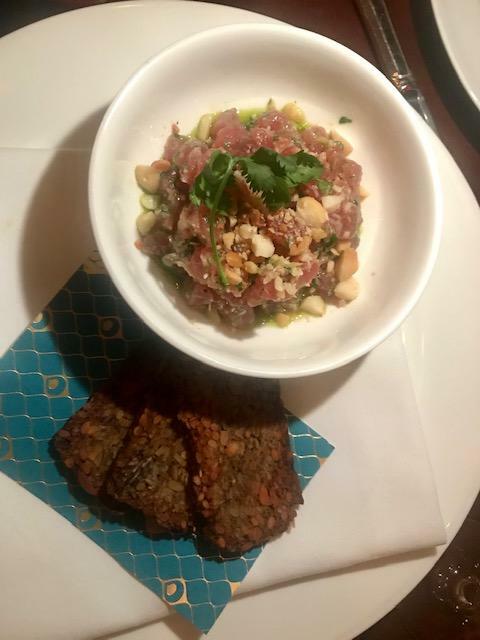 We also share the wild yellowfin tuna tartare. I insist my tablemates taste the chef’s signature raw scallops nuzzling uni in the shell and dressed with tomato water and mustard oil. 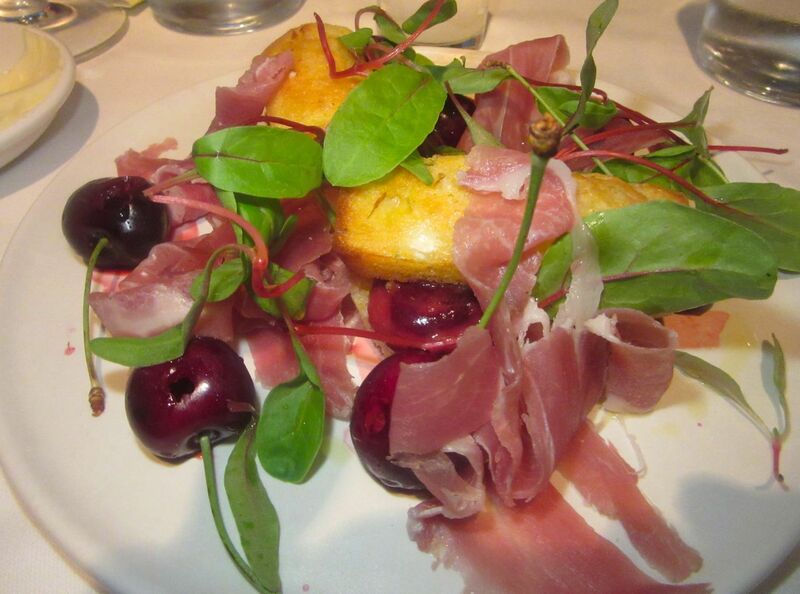 “It’s the first dish I ever created,” DiSpirito says. He was sure that in 1996 it was a new idea to have sour, sweet, salty, and bitter all in one dish. Fresh wasabi, cilantro and lime flavor the tuna tartare served with “game changing” toast. The chef himself in the corner of the kitchen tends to the risotto with red shrimp. 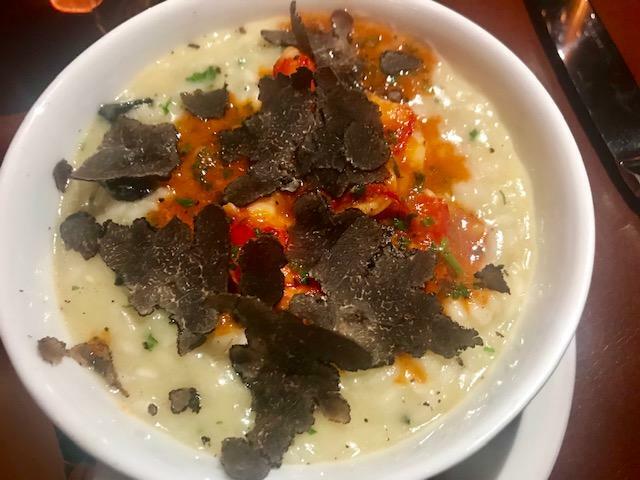 I choose the smaller version of that risotto with red shrimp, truffle butter, and a last minute shaving of truffles at the table. 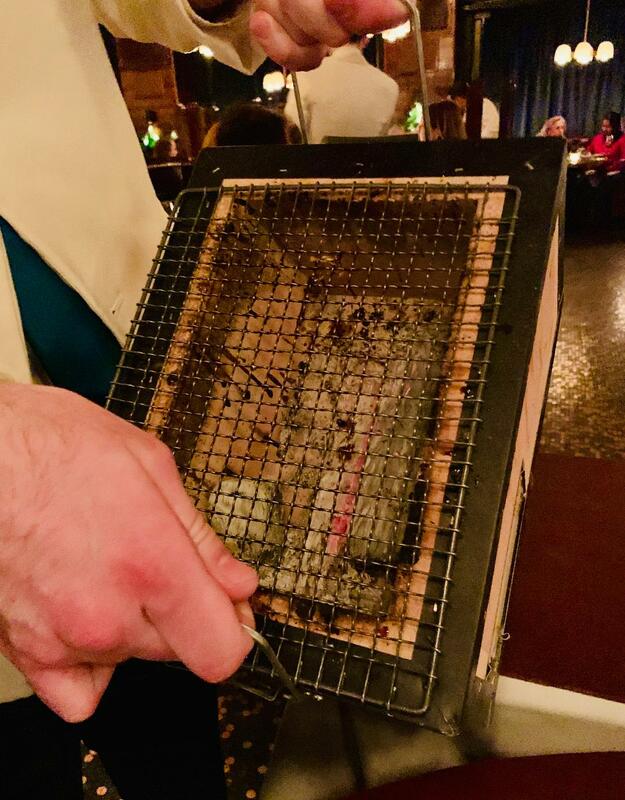 The waiter decides we need the $55 portion, grating extra truffles. It’s a little watery, but the scent is staggering. Three of us share the 14 oz. 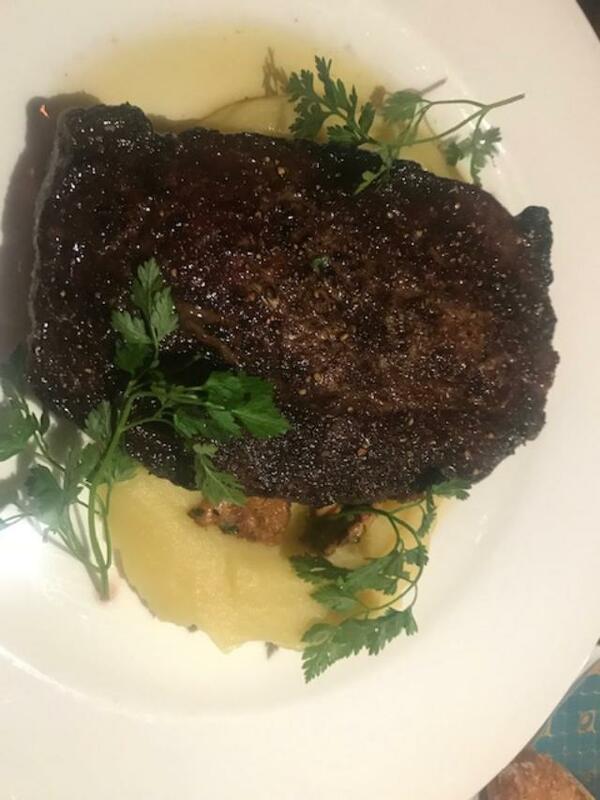 prime boneless ribeye, aged 60 days. Our friend from Montana has ordered the 14-ounce boneless ribeye. He thinks it’s great, but then you don’t necessarily get great ribeye in Montana. It’s good enough, and I’m thrilled he’s happy. His wife has chosen a side of charred Brussels sprouts in a creamy cashew sauce as her entrée. “Lovingly Cooked Organic Vegetables,” the menu advertises. 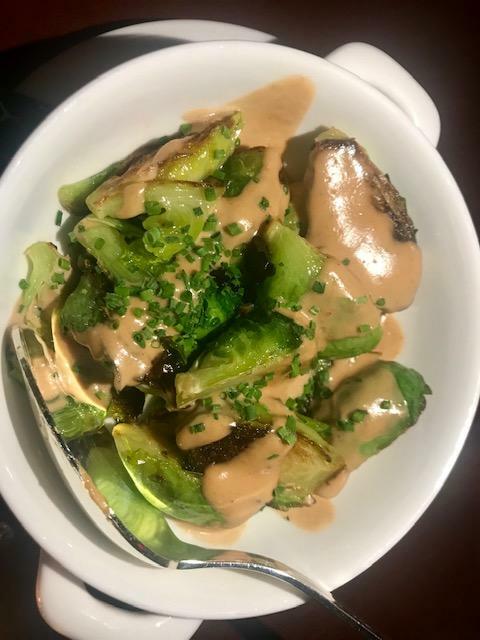 Charred Brussels sprouts are topped with creamy cashew sauce. 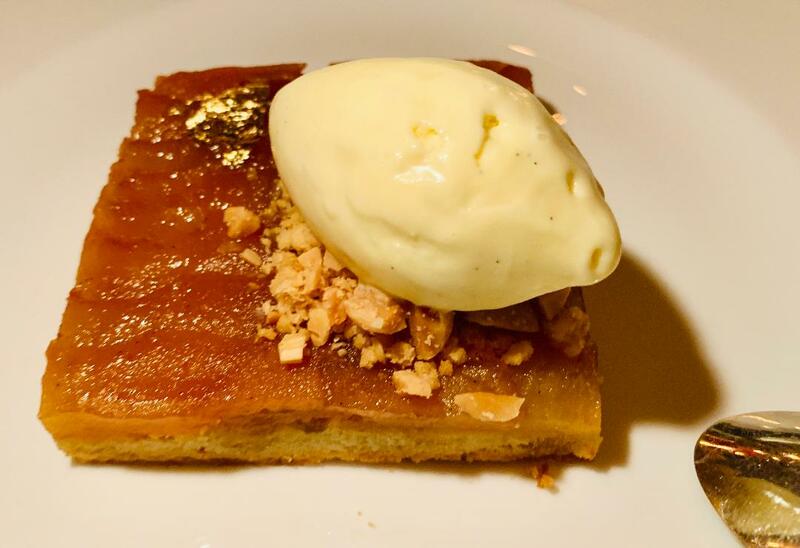 The apple tart tatin is sprinkled with crushed candied nuts. “All of our vegetables are grown by Trusted Farmers,” the menu adds in italics, listing them. (“All certified organic.”) Suddenly the chef himself arrives, kneeling next to me. “The waiter said you asked about me.” He looks up. “Oh no, it’s you.” We embrace. I introduce my tablemates. The chocolate mousse with brownies, chocolate sauces, and sea salt, and the tarte tatin that come after are his gifts. The kitchen grills food on skewers over Japanese white oak in the binchotan. The menu has so many promises that I decide I need to return before writing. Tonight’s booth is closest to the kitchen – is good for watching the action, but not very restful. Both servers and waiters have a way of flinging themselves into the room, dashing by us as if they’re completing the last few feet of the Marathon. It’s exhausting. Choose three skewers for $28 or six for $49 – peppers, mushrooms, scallops, asparagus, wild shrimp. I’m with friends who’ve not been before. 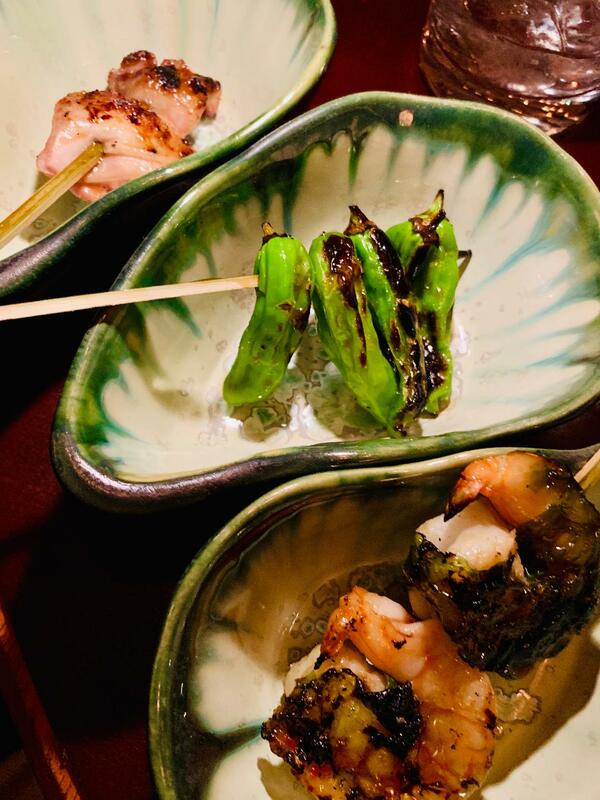 We choose shishito peppers, wild shrimp wrapped in sea lettuce, and boneless whole quail on skewers (three for $28, six for $49) grilled over Japanese white oak on something called a binchotan. Our waiters show us one, as I bite into half of a tender little bird. Short rib cooked 72 hours sous vide retains an unpleasant amount of fat. The short ribs have spent 72 hours sous vide, according to the menu, and the big slices are full of fat. I try to dissect a morsel of meat, but it’s defiantly fatty. “This is disgusting,” my friend Lyn announces, putting her beef back on the platter that will return to the kitchen mostly untouched. 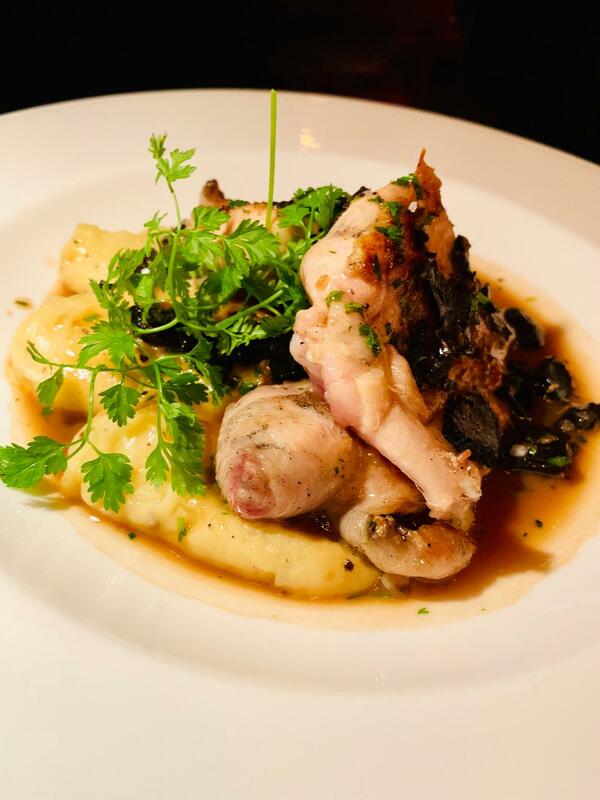 The poussin is cooked spatchcock and served with potato puree and black truffles. 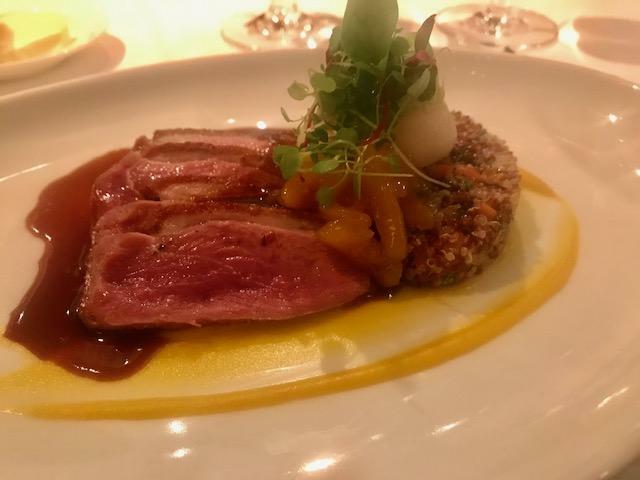 The duck is delicious nested in creamed spinach and crowned with candied kumquats. 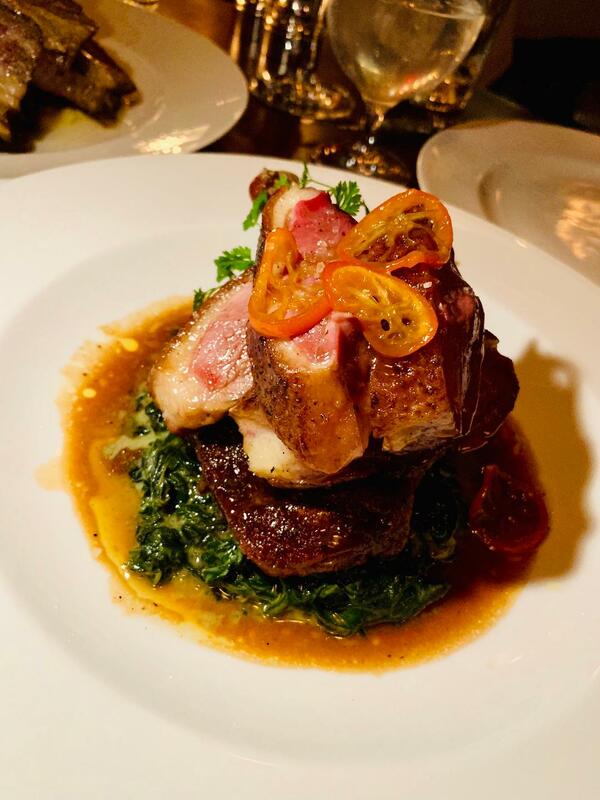 Fortunately, the whole truffled poussin Perigourdine is more appealing and so is the duck nested in creamed spinach with a crown of candied kumquats. Rocco comes out of the kitchen. “It’s wonderful you came back,” he says to me. I introduce the chef to my friends. I’m eager to escape the chaos bordering our table. The next day Didi complains about the fatty beef. “It’s the worst meal I’ve ever eaten,” she reports to a friend. 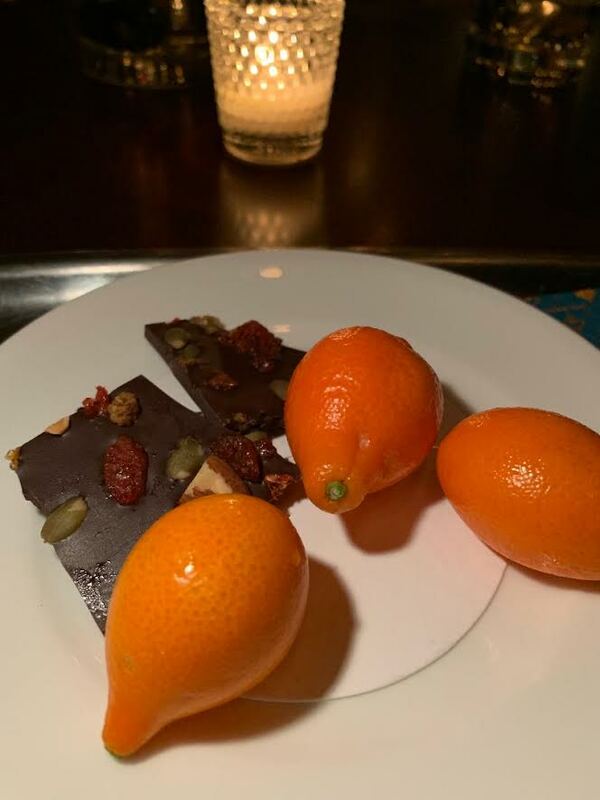 Oversize kumquats and chocolate bark with assorted nuts comes to the table as a finale. Was it that bad? Is there another option? 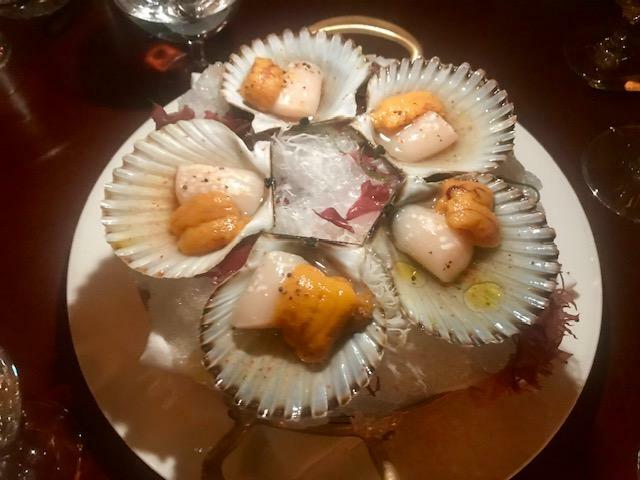 Try the uni and scallops, the salad, the duck, and the baked Alaska at a table in the middle of the room, away from the traffic. You decide. 846 Washington Street between Little West 12th and 13th streets. 212 645 4646. Tuesday through Saturday 5:30 to 10:30 pm.